Originally published 28 July. The Farthest will be broadcast on RTÉ One at 10.15pm tonight. IN SEPTEMBER 1977, a pair of small spacecraft were sent out to space, with the hope they would never return to earth. Now an Irish team has made a documentary on the Voyager programme, called The Farthest, which features interviews with the scientists involved, and stunning digital footage of the Voyager crafts’ journeys. The director, Emer Reynolds, told TheJournal.ie that she was inspired to begin the project due to her deep love of science. She studied pure mathematics in Trinity College Dublin, and fell in love with filmmaking after joining the student film society. So to be able to combine her two loves is clearly a career highlight for her. The film has been raking in the plaudits since it was first screened at film festivals, and was released in Irish cinemas this weekend. The documentary looks at Nasa’s plan to send spacecraft on an interstellar mission, in an effort to journey where humans could not. It shows how there was hope, too, that the little spacecraft might impart information on human life to those who might find it. That’s why a ‘golden record’ was placed on board each craft – a vinyl disc filled with sounds and images that depict human life up to the 1970s. A film editor who made the move to documentary making in the past few years, Reynolds says it has “been really humbling” hearing the hugely enthusiastic feedback about the film. “You get a real dose of joy every time you put it in front of an audience,” she says, describing the story as one of “human dreams and achievement”. 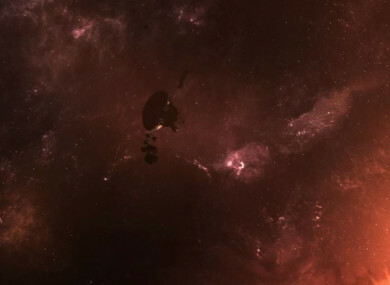 The story of Voyager had never been given the big-screen treatment until Reynolds and team came on board. A twist of fate meant that their idea could come to fruition quicker than they realised: it was just after she and producer John Murray began pitching the idea that Voyager 1 went interstellar, and media attention was on it yet again. Next, the filmmakers went through an intense research period, before tracking down the scientists who worked on the original project. Voyager, and the golden record, will never return home. They were sent from earth on a journey with no known end, to discover things we haven’t even dreamt of. One of the scientists working on the project was the above-mentioned Carl Sagan, and at one point he decided Voyager 1 should be turned around so it could capture an image of Earth. That image, known as the Pale Blue Dot photograph, was a huge moment for science and space exploration – and for the ordinary person in realising their place in the solar system. Reynolds describes this photo as a “real paradigm shift”, which led to more reflection on whether or not we are alone in the solar system. “We’re possibly alone. Could earth be the only place to harbour life?” she asks, posing a question which brings up the issue of “the responsibility that places on us to treat it better”. There is a message in The Farthest about “how unique and rare and a jewel this place [earth] is and how badly we are treating it”, says its director. “I’m very honoured to say people write to me and express feeling a real profound sense of awe, of questioning of their own humanity and their own place in the universe,” she says. Reynolds believes that, contrary to what some think, science is an emotional subject. “It’s a wonderful way for me to bring people into my perception of how extraordinary science is and how human and emotional and exciting it is, and deeply creative,” she says. “So that’s been a wonderful piece of the learning – that me and my team and Voyager and all the contributors in the film have been able to express that joy of science. It’s not dry and cold, it’s a well of emotion. It goes right to the heart of what makes it human. Beyond the topic at hand, what’s particularly striking about The Farthest is the number of women who worked on it. I ask Reynolds about this, and how it may tie into the recent moves by the Irish Film Board to address gender imbalance in Ireland’s film industry. “It’s wonderful now to see, the change is so positive and it’s so dynamic. And it’s a real turning of the wheel, which I really applaud,” says Reynolds of the deliberate steps to bring about gender parity. Over the years she worked as a film editor, just a “minuscule fraction” of the directors she worked with were women. “Encouraging women into key positions is fantastic for everyone,” she says. The film itself reflects that. “We took it as read that women’s voices would be loud and proud in it,” says Reynolds. This also reflects the growth in acknowledgement of women’s role in scientific discoveries, such as the film Hidden Figures. After the documentary was shown at the Audi Dublin International Film Festival, Reynolds got three letters from young girls (two aged 10 and one aged 12) telling her they want to be scientists. The digital effects in the film are incredible, and were created in just a year by the Monkstown-based Benny Kenny. ”Hollywood films would normally have hundreds of CGI artists – we had one,” says Reynolds, praising Kenny’s work. But though the documentary is beautifully realised, and awe-inspiring to watch, it’s not just for ‘space nerds’. It’s for everyone, says its director. “It’s more than a film about space, it’s a film about heart and soul and wonder and beauty. It’s that feeling that I want to get across – it’s just one to show all the family,” says Reynolds. The Farthest is in cinemas from this weekend, and goes on theatrical release in the USA from 11 August. The Farthest was supported by Bord Scannán na hÉireann/the Irish Film Board (IFB) and produced in association with HHMI Tangled Bank Studios, RTÉ, BBC, ZDF, Arte and PBS. Email “An Irish documentary tells the incredible story of the Voyager spacecraft”. Feedback on “An Irish documentary tells the incredible story of the Voyager spacecraft”.